Home Business Are Regional Population Trends in Cincinnati and Dayton Entangled? Are Regional Population Trends in Cincinnati and Dayton Entangled? Anyone in this region knows that Cincinnati and Dayton are closely influenced by one another. Perhaps you could say that Cincinnati, being significantly larger, influences Dayton more than Dayton influences Cincinnati, but you might not want to say that to anyone in charge at the Cincinnati-Northern Kentucky International Airport. A new study conducted by Alberto Hernando de Castro for the École Polytechnique Fédérale de Lausanne in Paris found two trends in the population growth and decline of Spanish cities. His team was able to determine these trends by developing a model based on population data collection from 8,100 Spanish municipalities between 1900 and 2011. One of the trends Hernando’s team noted in the study was that a city’s growth rate depends on the growth rates of neighboring cities. And it was specifically noted that cities within 50 miles of one another become “entangled” in a way that if one grows, the other grows as well. It is this trend that is perhaps most interesting for the Cincinnati-Dayton metroplex, where the two core cities are less than 50 miles apart. The primary cities of both regions peaked in terms of their population in the middle of the 20th century, but metropolitan area population growth has more or less continued for both up through the 2010 Census. 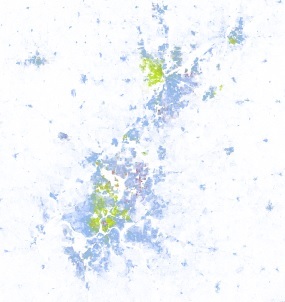 The Dayton metropolitan statistical area (MSA), with 841,502 people, has suffered two decades of population decline – the first from 1970 to 1980 and the second from 2000 to 2010. The Cincinnati combined statistical area (CSA), meanwhile with 2,172,191 people, has never recorded a decade of population loss. With that said, the population growth trends for the two cities do tend to mirror one another. From 1950 to 1980 both regions saw their population growth slow significantly, with Dayton leading the way. The two areas then saw an uptick from 1980 to 2000, with Cincinnati leading the way. If the Cincinnati-Dayton metroplex is in fact following this trend noted by Hernando and is researchers, then it would appear that Dayton’s slowing growth in the middle part of the 20th century brought Cincinnati’s down with it, or whatever factor led to this change in Dayton had similar effects on the nearby Cincinnati market. 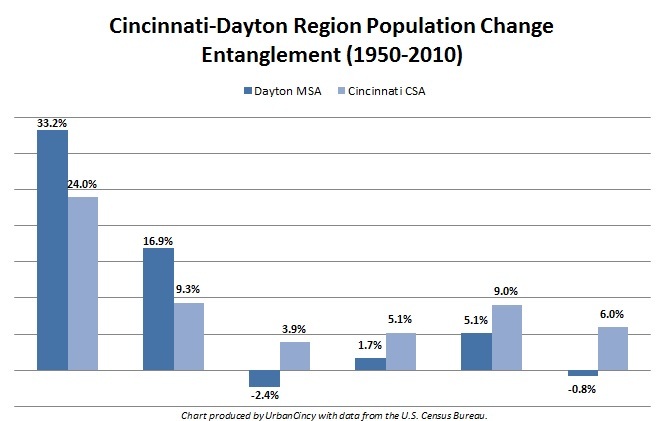 The same would be true, but in opposite fashion, for the latter part of the century when Cincinnati’s rebounding population growth seemed to pull Dayton along with it – even reversing the slight population decline the Dayton MSA experienced in the 1970s. The other trend noticed by the researchers was that cities seem to grow based on a 15-year memory – meaning what happened within the past 10 to 15 years serves as a reasonable indicator for what will happen in the next few years. This analysis, of course, is more accurate the closer the years are to the base year, and less accurate the closer the data is to the 15-year extreme. If this trend is also true, might it mean that the Dayton MSA will post a population gain between 2010 and 2020, as a result of Cincinnati’s population gains lifting up Dayton’s population decline as it did in the 1980s? Or will it mean that the population gain for the Cincinnati CSA will be even less than the 6% gain posted last decade, as a result of whatever is dragging down population gains in Dayton? Time will tell, but so far the two noted trends seem to apply to the Cincinnati-Dayton metroplex. In what way, exactly? Good question.